Comments on Construction. This was a straightforward build. It has metal etch re-railers that attach to the lower hull which are slightly fiddly. These can be left off, which would result in quite a quick build. Comments on Construction. This kit is basically the same as the D-37, but with a different turret, and also has a frame aerial. Being the same hull, this kit also lacks rivets around the doors & side gun ports. 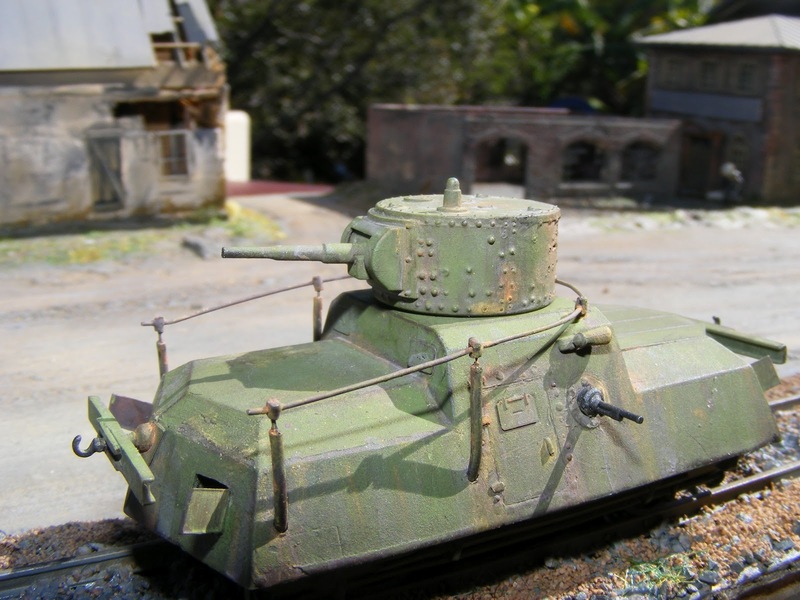 The early T-26 turret supplied in the kit also lacks rivets. The kit comes with a piece of wire bent approximately into a horse shoe shape for the aerial, and the supports for it are metal etch. Again no doors or hatches are separate, all are cast closed. Other comments. I decided to add all needed rivets, which was a time consuming undertaking. I used the tiny balls found in water filter units (these water filter units can be bought at any hardware store). To place the "rivets" I countersunk holes with a micro drill bit, then dampened a 000 paintbrush with water, to pick up a water ball then placed it into the hole. The real turret has rivets of varying sizes, the water filter also contains various random sizes of water filter balls to choose from. When a row was completed I would brush over a light diluted coating of clear acrylic to seal them in place. The clear acrylic coating is very thin, and is invisible once dried. I discarded the etch horse shoe supports as they are very two dimensional, and made some from insulated single strand wire, which closely match the real appearance of these supports. Also used my own 0.44 wire. As a final touch I opened up the covers for the concealed lights, placing lights inside the hull.